If you're looking for a drink, a snack, a casual meal or just a good coffee with a sea view then the South Eastern Bayside suburbs of Melbourne could be just the place as they offer quite a few cafes that are either right on the beach or within metres of the sand. 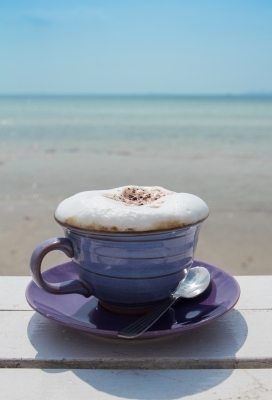 Starting from Beaumaris in the South and travelling North, here are some of the venues where you can enjoy coffee and affordable eats on the beachfront. The Teahouse is literally right on the beach and it's a lovely shallow, child-friendly beach. It's licensed and foodwise offers a range of breakfasts, fish and chips, sandwiches, foccacias, quiches, pies and more. Vegetarian and gluten free options are available and there's also a selection of ice creams and cakes. The Kiosk attached to the cafe can provide takeaways if you prefer to find your own spot on the beach to eat. Open from 9.00am on weekdays and 8.00am on weekends and public holidays. The Cerberus Beach House Kiosk is on the ground floor of the Cerberus Beach House Restaurant. The Kiosk serves great fish and chips, burgers, salads and drinks. See this page for the menu. Open Tuesday through Friday from 10.30am until sunset and on the weekends from 9.00am until sunset. Closed on Mondays. Grab a table to eat your fish and chips or wander down the beach or out onto the pier. The Sandy Beach HQ & Kiosk is a Stand Up Paddle, Windsurfing and Kitesurfing school with a Kiosk. The Kiosk has great ambience, indoor and and outdoor seating, coffee and food. The beach is a very short walk away and it's child and dog-friendly. If you're so inclined you can peruse your options for Stand Up Paddle/Kitesurfing/Windsurfing lessons with your coffee. Open seven days 9.00am until 4.00pm. The Middle Brighton Baths Cafe & Bar is of course part of the Middle Brighton Baths on the beach. They offer breakfast, lunch and dinner, indoor or outdoor seating and great views. Open seven days, 7.00am until late. Peruse their menus here . Almost on the beach at the end of North Road in Brighton is the North Point Cafe. Open for Breakfast and Lunch 7 days a week from 7am – 5pm the cafe has a variety of breakfast options plus fish and chips, burgers, salads and more. Vegetarian and gluten free options are available and a selection of beer and wine. Just across the road there's a children's playground to keep the kids entertained and walking and cycling tracks alongside the beach. Port Phillip Bay is one of Melbourne's best features so why not take the opportunity to enjoy a meal or snack by the beach with a view. A note about parking - while all of the venues have parking available in close proximity, a lot of it is ticketed so bring along some change. Some of my favourite spots! What an excellent informative article with great photos.